You guys. I’m almost not even sure how to write this post for two reasons: 1.) I’m supposed to #keepthesecrets so that all fans can enjoy the sheer magic of Harry Potter and the Cursed Child, and 2.) I don’t know if I can truly express with words how I felt before, during, and after this show! But I will try. If you want to skip the retrospective part of the post and get to the review, skip to the photo of my English breakfast and start there. First, let’s go back to when the script was released in July 2015. I devoured it as quickly as Crabbe and Goyle gobbling Sleeping Draught-laced cupcakes. I read it in one sitting as per my usual Harry Potter book routine. I enjoyed the story, but I quickly realized it needed to be consumed in its proper format on stage. So I reserved my final thoughts until if and when I could see the full production. Skip ahead to October 28, 2015, the day that tickets first went on sale. 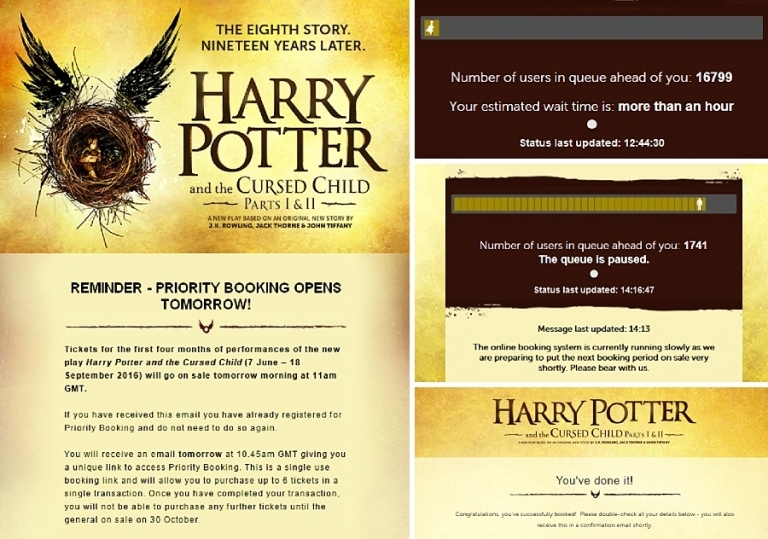 I didn’t actually think I would be able to score tickets, but just in case luck was on my side, I had signed up via email for priority booking which was to start at 11am GMT on October 28th (6am my time). I was supposed to get an email that day at 10:45am (5:45am my time) with an access link to purchase the tickets, but it didn’t show up on time. Panic ensued, but I’ll make a long story short – I finally received my access link three hours later after hitting refresh on my email every few seconds for three hours straight. When I clicked the “Book Now” link in the email, I was placed into an online queue where I was number 16800. At that point I was pretty sure I wouldn’t get tickets without a vial of Felix Felicis, but I’m stubborn if nothing else and I figured I could just leave the queue running while I worked. Every once in a while the queue would get stuck or pause with updates and messages, and my expectations lowered even more. After a couple of hours, I was actually at the very front of the line…only to find out that tickets had just sold out. Aw, bummer. But THEN the screen refreshed to let me know another section of tickets had opened up for later dates! And I was at the front of the queue! It was my turn within minutes, and I quickly selected a date and put tickets in my cart. Upon successful checkout, I managed to purchase Row A tickets in the stalls! WHAT?! Basically I caught the golden snitch during the Qudditch World Cup. So it actually happened. The tickets were mine, and I immediately got started on planning a little trip to London! I screen-printed everything just in case because I couldn’t believe it. I heard stories of people who had tickets in-cart but lost their selections due to system glitches, so I feel quite fortunate to have had the opportunity to see the show. I hope everyone who wishes to go is soon able to do so. They continue to open up new dates in London, and there is even news of the play coming to Broadway. It’s worth the wait, I promise! Fast-forward to November 2016, and there we were in London! We arrived on a Thursday with plans to see both parts of the play on Sunday. I dragged Chris to the Palace Theatre on the first night of our trip to see the facade with my own eyes and pinch myself. 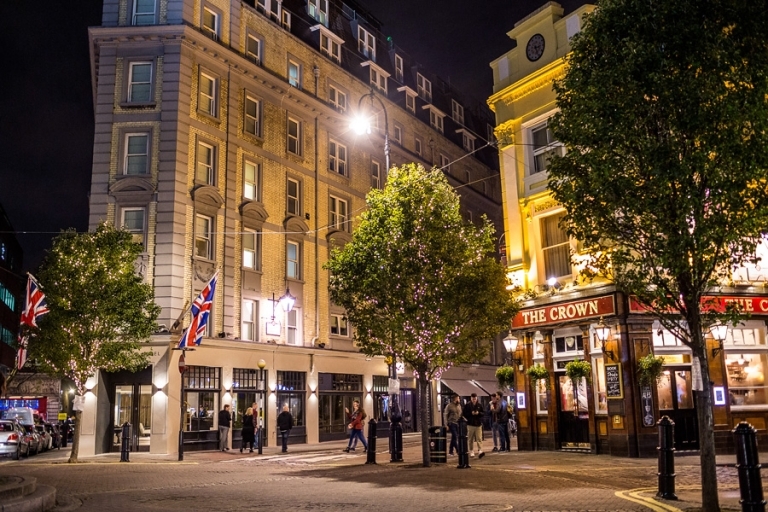 Our hotel in Seven Dials, the Radisson Blu Edwardian Mercer Street, provided the perfect point for easily reaching the theatre district and the bustle of Covent Garden while still remaining quiet enough for sleeping at night. It sits about two blocks from the Palace Theatre, and we loved it. We’d happily stay there again. Sunday morning Chris and I enjoyed a big brunch at Bill’s. I made reservations to ensure we had plenty of time to pick up tickets and settle into our seats before the show started. The St. Martin’s Courtyard location is pretty close to the Palace Theatre (and also to our hotel) and it was a fantastic choice. The Bill’s Breakfast with the addition of bubble and squeak filled me up so I could last through Part 1 of the show. After our late breakfast, we headed over to the theatre to pick up the tickets. 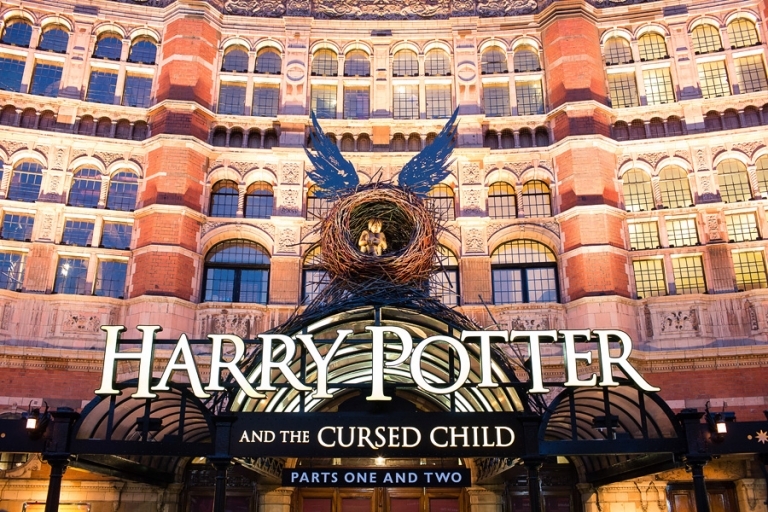 Note: the box office is located along Shaftesbury Avenue, not on Charing Cross Road. I may or may not have let myself in through the front entrance of the theatre in a moment of over-excitement. It may or may not have been a little embarrassing when the staff, surprised to see me inside the closed doors, politely explained that I was not supposed to be in there and that the box office is on the side. Oops. We queued up with hundreds of other people about an hour before the start time for Part 1. The line wrapped around all sides of the building, but it moved quickly and we were inside with plenty of time to spare. Of course, I purchased a program along with the Souvenir Brochure. Pro tip: a few souvenirs are sold at the refreshments stands, so if the lines are too long at the main gift counter, check the other spots. Obviously photography is not allowed once the play starts (which people dutifully respected), but I did snap two pre-show iPhone photos including one of the stage. I don’t think it’s too much of a spoiler, especially since the image quality is quite terrible! Eventually I settled in and managed to enjoy the show without a giant lump in my throat. I felt a huge relief as my original suspicions were confirmed, that reading the script as a standalone book hardly does the story justice. It must be seen as it was meant to be consumed, as a stage production with loads of talent and passion poured into the acting, set design, lighting, costumes, music, and effects. Granted, I still treat Harry Potter and the Cursed Child as a bonus side story and not part of the original series, but I welcomed the opportunity to hear from Harry and the gang one more time. Part 1 ended on a huge cliffhanger and also left us quite hungry so we opted to do an early dinner. I highly recommend an amazing restaurant nearby perfect for a pre- or post-show meal called Burger & Lobster. We ate there in between Parts 1 and 2 and absolutely loved it. The Soho location (Dean Street) is pretty convenient to the Palace Theatre and service was prompt, allowing us to return for Part 2 in plenty of time. Only burger and/or lobster are available on the menu, so it’s pretty easy and quick to decide on your order when your mind is swimming with thoughts from the play. Chris opted for both selections, and I tucked into this delicious burger with fries. And as if I wasn’t already hyper-excited enough, we also happened upon the most amazing you-have-to-go-here gallery and store dedicated to Harry Potter artwork called House of MinaLima. Seriously, if you’re a Harry Potter fan, I implore you to visit this shop or at least check it out online. It’s a fantastic collection of gorgeous artwork and I had a difficult time not walking out with one of everything. Not to mention the decor is so fun – even the floor is decked out in mischief. When we were at the WB Studio Tour on Friday, I had scoured the gift shop looking for something Harry Potter-related to commemorate this London trip, something subtle that wouldn’t look out of place hanging on our wall at home. I didn’t find anything like what I envisioned short of asking if I could purchase copies of the Hogwarts blueprints in the Art Department (the answer was no). Lo and behold, I found exactly what I wanted at MinaLima, this truly lovely Whomping Willow print that I am having matted and framed as we speak. I love it. Part 1 was definitely my favorite, but Part 2 had its moments. There is a scene in Part 2 so painfully moving and brilliantly executed by the cast, I wasn’t sure I’d be able to breathe again. The show ended with the entire audience on their feet for a standing ovation perhaps more enthusiastic than I’ve ever experienced. My final spoiler-free thoughts on the play? I loved it. It’s bewildering and bewitching. Pure spell-binding magic. It’s not completely without flaws (there are a couple of plot points I find a little silly and at times I felt like the story could have been trimmed/tightened up a bit), but the superb acting, the gorgeous score, and the costumes, illusions, and sets more than make up for it. It’s such an incredible theatrical experience that surprised me so many times in ways I didn’t expect since I had already read the script. And I really don’t want to say too much more than that! #keepthesecrets, right? 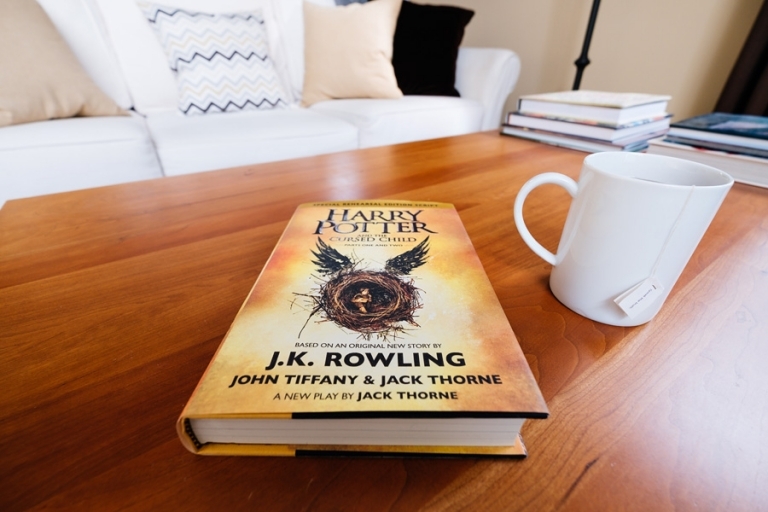 On the whole I found the play worthy of a special spot in Harry Potter fans’ hearts including mine. I officially give it an Outstanding on the O.W.L. grading scale. Susan - Yep! I took a few photos inside the theatre before the show with my iPhone. But once the show starts, naturally phones have to be silenced and put away. 🙂 Enjoy!